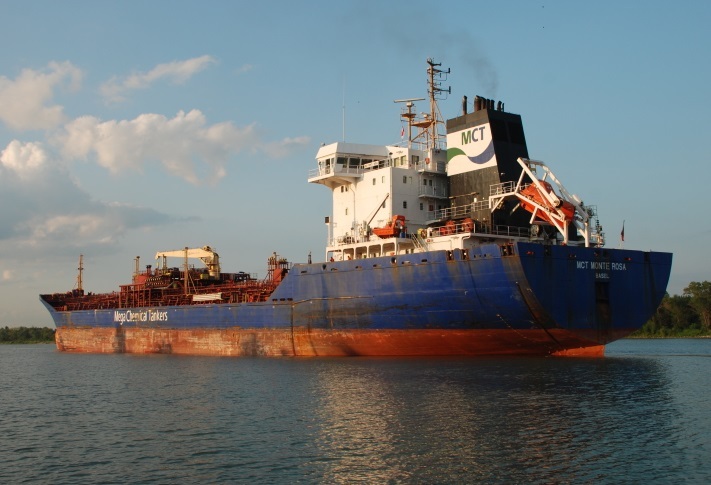 The chemical tanker SCT Monte Rosa suffered engine failure in Lake Ontario at the mouth of the Cataraqui and St. Lawrence rivers. The vessel was en route from Hamilton to Belledune in Canadfa, but lost propulsion power after blackout and mechanical failure. The chemical tanker SCT Monte Rosa remained adrift, but succeeded to drop anchor and secured at Kingston anchorage. The accident was reported to the local authorities and was contracted shore engineer to assist with repairing of the blocked engine. Also were ordered spare part for the needed repairs. The vessel remain for second day anchored at the Kingston anchorage. The traffic is not hampered and the there were no injured people during the minor incident. The chemical tanker will resume voyage after inspection and special survey. “Radio traffic indicates the ship’s engineers cannot find the problem and are waiting for a shore engineer to come aboard”, said the official statement of the Coast Guard. The chemical tanker SCT Monte Rosa (IMO: 9298363) has overall length of 164.00 m, moulded beam of 23.00 m and maximum draft of 9.50 m. The deadweight of the ship is 20,718 DWT and the gross tonnage is 12,776 GRT. The vessel was built in 2007 by Qingshan Shipyard in Wuhan, China. The chemical tanker SCT Monte Rosa is operating under the flag of Switzerland, managed by Mega Chemicals Schiffahrt.